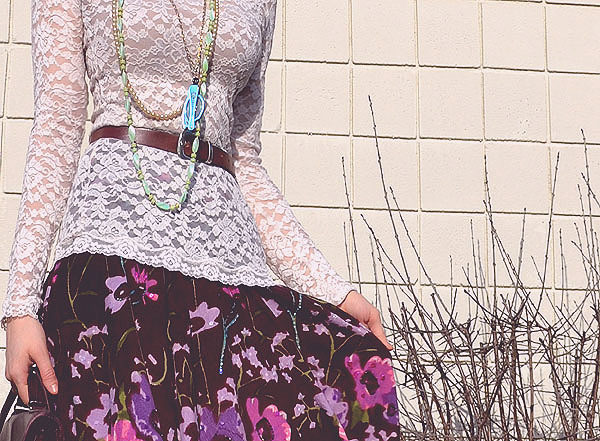 dressed up like a lady: Doily-chic? I actually wore this lacy outfit last week, but it's just as well that I didn't get around to posting it until today, as I've mostly been wearing worn out jeans and concert t-shirts for the past few days -- which were largely spent moving furniture (we got a new vintage couch, which I can't wait to show you), and dusting off books before placing them on shelves. Your waist is so tiny *. * I love your skirt! Fantastic! You are so tiny! I love the way you mixed the patterns. Hope the unpacking is going well. Another gorgeous skirt! Just lovely! And how do you manage to pose outside when it's cold and still look so lovely? Major modeling skills. Can't wait to see pics of your new digs! this look is so adorable. i love every single piece of it.